Clawfoot tubs have a romantic association that can be extremely appealing to some homeowners. They complement a wide range of retro and Victorian-style bathrooms and may be the perfect addition to many older homes. When fitted with a ring, they can also be used as a shower, offering the same utility as an alcove tub/shower unit but with a unique style. The two most commonly used materials for clawfoot tubs are acrylic and cast-iron. Both have positive and negative attributes to consider before installing. We outline the differences between them so that you can make a more informed decision for your home. Clawfoot tubs come in two general styles: slipper and roll-top. A slipper tub has a high, raised end for supporting the bather. A double slipper has two raised ends. Roll-top tubs are level across the top but have a rolled or rounded rim. Both acrylic and cast-iron tubs come in slipper and roll-top and are available in single or double configurations. They may also have a drain at one end or in the center, allowing for different installation positions. Traditionally, only the interior of a clawfoot tub is finished because the exterior is designed to be painted. With an acrylic tub, this is usually done at the factory, so your tub arrives with a smooth, finished surface. Cast-iron tubs, however, are unfinished on the exterior when they arrive. You must have the tub finished, usually painted, after installation. An interior house painter can do the painting at a rate of $20 to $35 an hour. Expect a minimum of two to three hours for completion. The feet on both types of tubs come in several styles and finishes. In most cases, an acrylic tub will have acrylic feet, and the finishes and styles are slightly more limited. Cast-iron tubs have removable feet, so they may be made of a variety of metals and have several styles. The feet are screwed onto the tub during installation and leveled. From a casual glance, it is often difficult to tell the difference between the two materials. However, an acrylic tub will be smoother all over with a plastic sheen. A cast-iron tub will have a smooth, porcelain interior but a rough, painted exterior finish. Clawfoot tubs are extremely heavy and may require additional reinforcement of the flooring as well as a way to get them into the bathroom. Therefore, they are usually recommended for first-floor bathrooms. Acrylic tubs are lighter and require no additional flooring alterations. They can easily be carried upstairs and are usually recommended for bathrooms on upper floors. Once the tub is in the room you intend to install it in, the installation process between the two materials is similar. The tub is moved or positioned to where you want it. If the feet are not already attached, this will be screwed into place and leveled. The plumbing is brought up through the floor or a nearby wall and secured to the wall of the tub. The drain and overflow valve are hooked up and brought down through the floor. If a shower is desired, this is hooked up at the same time. Once the installation is complete, the tub can be given a painted exterior if desired. The main difference between the two is getting it to the bathroom where it will be installed. Cast-iron tubs are very heavy, requiring four men to carry it to the bathroom. Acrylic tubs are lighter, requiring only two people. The subfloor 1 and floor joists beneath the tub must be inspected before installation and strengthened if necessary. A cast-iron tub is heavy on its own, but it also must support the weight of the water when full as well as the weight of the bather. Therefore, the floor may need to support over 1,000 pounds in one area. For this reason, first-floor bathrooms are usually the place to have a cast-iron tub installed. For either tub, the process is carried out by a plumber for the installation. Most plumbers charge between $45 and $65 an hour. This cost is higher for a cast-iron tub than an acrylic tub because more labor is required to move the tub. Therefore, expect to pay around $500 for an acrylic tub installation and closer to $1,100 for a cast-iron one. If the floor joists need to be reinforced, include an additional cost of $100 to $300 per joist. While a cast-iron tub costs significantly more to install and finish, it will not necessarily cost more than the same tub size, shape, and configuration in acrylic. Both fall into a similar range of costs depending on the style for the tub itself, influenced by style, size, shape, and in the case of acrylic tubs, color. The style and finish of the feet you choose for the tub will also impact the final cost. For a 67-inch roll-top tub made of cast-iron, expect to pay between $1,200 and $1,500 for the tub. For the same style and configuration of the tub in acrylic, expect to pay between $1,100 and $1,400. Including installation and finishing of about $200, a cast-iron tub will, therefore, cost around $2,500 to $2,800, while an acrylic tub will cost approximately $1,600 to $1,900. While clawfoot tubs are generally used for soaking, they can also be fitted with a shower. The plumbing typically comes through the floor, and then the pipes extend to the ceiling where a ring holds the heat and shower curtain. Support rods hold it steady by connecting to either the ceiling or a nearby wall. This plumbing can be heavy, however. Cast-iron tubs are strong and durable enough to support the pipes without concern. Acrylic tubs may bend or warp over time if a shower is installed with them, which means that the tub will not last as long. If you plan to install a shower with the clawfoot tub, cast-iron is generally the preferred way to go. Acrylic and cast-iron tubs are both fairly low-maintenance. Acrylic tubs, however, are slightly porous and can scratch or stain. Hair color, for example, will stain an acrylic tub and abrasives may scratch the surface. Any potentially staining spills should be wiped or rinsed out of the tub quickly, and use soft cloths and non-abrasive cleansers to clean the tub. If necessary, stains can be bleached out. 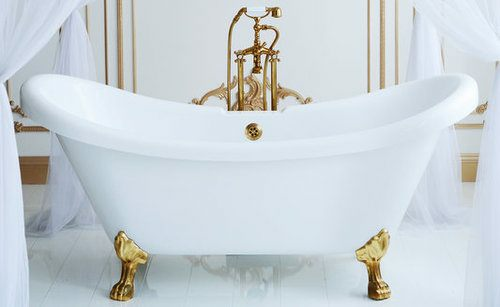 Cast-iron tubs are coated with a thin layer of porcelain on the interior. This porcelain finish is non-porous and unlikely to stain or scratch. Therefore, it may require less maintenance long-term. You can clean the tub with any cleanser or cleaning materials because the finish will not scratch. In a cast-iron tub, the exterior finish is painted on. Over time, you may wish to refresh this color with a new coat of paint. Some acrylic tubs can also be painted, but most have a factory finish that does not need any regular maintenance or repainting to maintain. While cast-iron is an extremely strong and long-lasting material, the porcelain finish on the interior of the tub can chip if given a hard knock. When chipped, you will see the cast-iron below. Because the iron is now exposed, it may begin to show rust. This can be refinished, if desired, usually with a spray-on coat of porcelain. 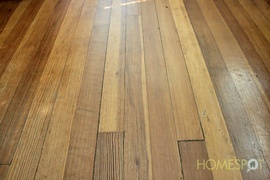 The cost of refinishing a tub is around $500, which is significantly less than it would cost to replace the entire tub. Acrylic tubs have a finish that goes straight through. Therefore, the finish will never crack or chip. It can stain and scratch, however. It may also warp slightly with long-term use. Cast-iron tubs last much longer than acrylic tubs, making them ideal for high-traffic areas. Cast-iron tubs are designed to last. They are also more authentic, being made in the same way that tubs were built 100 years ago. For that reason, they are considered an asset to high-end bathroom designs and add value to the home. Acrylic tubs help provide the same style but do not add value the way a cast-iron tub will. How much does it cost to install an acrylic or cast iron clawfoot tub in my city? Cost to install an acrylic or cast iron clawfoot tub varies greatly by region (and even by zip code). To get free estimates from local contractors, please indicate yours.